Mobile medical carts are a necessity for the modern medical facility. They mobilize medical care for patients with features such as medical storage drawers and secure disposal containers, allowing care providers to prioritize a patient’s comfort and access to care. Incorporating battery-powered medical carts into your workplace speaks to your commitment to good business practices and the well-being of your patients. Because of their benefit to both the provider and the patient, they have quickly become the standard in medical care for many reasons. Powered carts allow for complete ease-of-use. They incorporate many of the design elements of non-powered carts with the convenience of modern technology. 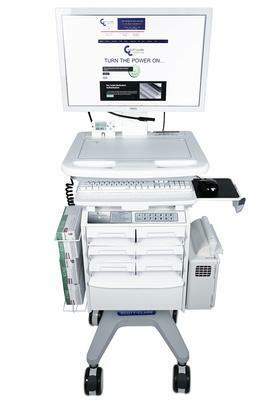 The medical-grade computers that are a standard of powered carts can be seamlessly integrated into your existing program system at your hospital or medical facility. This makes client and file transfers effortless and ensures the information you need is available at your fingertips at all times. The powered carts available on the market today offer top of the line customization and can easily be configured to your specific needs. While non-powered carts can also be customized to a point with design elements such as disposal containers, medical storage drawers with automatic locks, and adjustable height controls, powered carts can be further tailored to your needs. This includes electrical features such as barcode readers and a full range of monitors in varying sizes and numbers, as well as camera and iPad attachments. These features are designed for longevity and allow your cart to be adapted as the needs of your business change. Scott-Clark Medical battery-powered medical carts are designed to provide you with a medical office at your finger-tips. 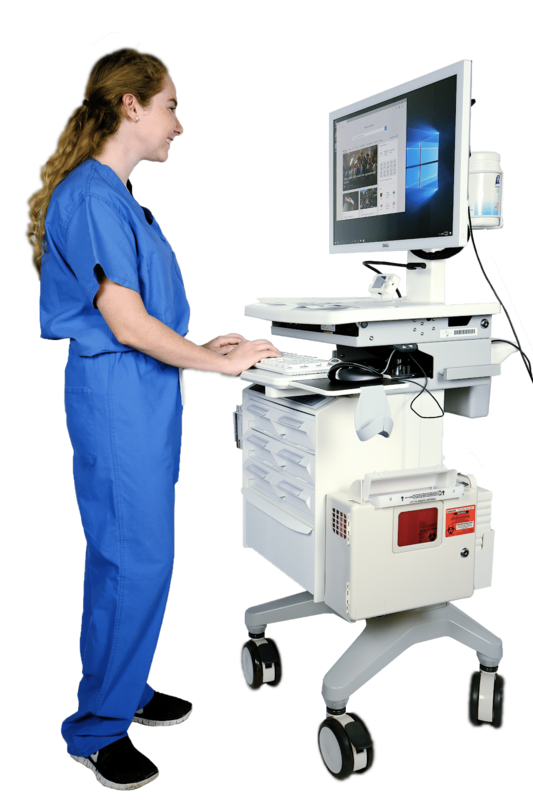 While a non-powered cart can, of course, carry a laptop, the technology that is integrated into a powered cart is specifically designed for use in the medical field. This includes features like an automatic and silent operation system that allows you to concentrate fully on the job at hand and is non-invasive for your patients. Mounted vital signs monitors and wristband and medication-label printers are two more invaluable features of powered carts specifically pioneered for medical workers. In the past, a major flaw with battery powered carts has been the necessity of recharging and allowing for a cool-down period between uses. Recent advancements in technology have nearly eliminated this hindrance. The Scott-Clark Medical battery powered cart boasts not only an 80% increase in battery power storage but also a reduction in charging time by 50%. This means these lightweight, aluminum batteries are not only long lasting but also supply clean energy. You no longer have to worry about making it through a shift without having to call IT to help switch batteries out. This means you and your staff can spend more quality time with patients and focus on delivering the quality of service that your practice is known for. Powered medical carts are one of the most efficient ways to bring your medical office up to speed and optimize your patient care. When it comes to running a successful business, two of the essential traits are organization and optimization. Integrating these qualities means taking the opportunity to ensure your work environment is functioning efficiently.